Original painting is acrylic on canvas measuring 12" x 16"
U333's four year war-time career was extremely eventful. 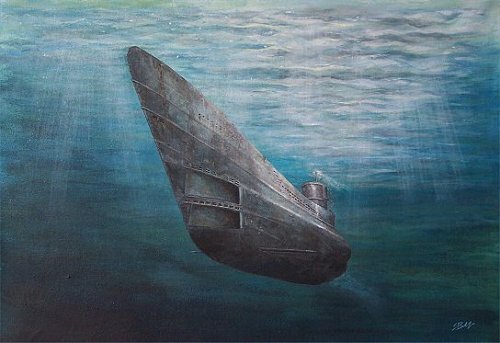 Operating as part of the 3rd U-boat flotilla out of La Pallice she sank 8 ships - the majority of them claimed by the famous Peter "Ali" Cremer (later commander of Doenitz's body guard unit). Cremer gave the boat her '3 little fishes' emblem (after a popular American tune of the time) - they are just visible in this painting He also has the remarkable distinction of accidentally ramming 3 enemy ships and surviving the events. Eventually he was seriously wounded and finally left the boat in June 1944. Following his departure, Hans Fiedler took command for 2 patrols with no success. He and his 45 crew were killed in action 31 July 1944 by HMS Loch Killin & HMS Starling. Only 100 prints of this image have been produced. Each one signed & numbered by the artist.